"My favorite lens is the 12-24mm f/4G ED-IF AF-S DX Zoom-Nikkor," says Klifton Keplinger. "I shoot mainly child and wedding photography, and surprisingly this lens works into both. 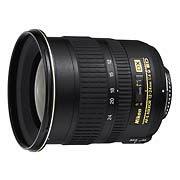 I use it along with the 50mm f/1.8 and 85mm f/1.4 to make my perfect kit." "Even though I shoot more with the 50mm and 85mm, the 12-24mm adds a dimension to the compositions that really makes things look out of the ordinary. Instead of thinking 'traditional portrait' when I view a photo made with the 12-24mm, I tend to think 'National Geographic.' It also leads more to the environment the portrait was taken it, making you feel more involved in the photograph and what is going on."